Welcome to Elite Court Reporting Agency in Columbus, OH! Need court reporting services in the Columbus region? Simplify your Columbus proceedings with one call to Elite Court Reporting Agency, an Ohio-based, full-service agency serving cities and towns throughout Ohio, including Cincinnati, Dayton, and Cleveland. 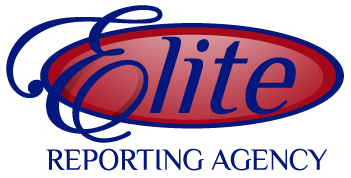 Elite Court Reporting Agency handles all your Columbus court reporting needs. We supply reporters, videographers, and videoconferencing facilities to cover your depositions, arbitrations, hearings, meetings, and conventions. In other areas of Ohio, court reporting services can also easily be arranged by Elite Court Reporting Agency through our network of court reporters throughout the state. Our Nationwide Schedule Services also make it easy to meet all your court recording needs in other parts of the country. Finding reporters, videographers, videoconferencing facilities and/or locations to hold out-of-town depositions and meetings can be time-consuming. Let us make the arrangements for you! Schedule a court reporter, videoconference, or videographer anytime, anywhere, with this free service. Payment is made simple for all services via Visa, MasterCard, and American Express.